George McCoy moved to Chapel Hill in 1971 to be closer to UNC — an epicenter for hemophilia research. For more than 40 years, he’s participated in clinical trials and was the first person in the world to receive synthetic Factor VIII treatment (called recombinant Factor VIII) at UNC in 1987. Bruising. Unexpected bleeding. Joint pain and swelling. Daily needle injections. Social isolation. All of these struggles are part of the daily routine for someone living with hemophilia — a rare disorder that prevents the blood from clotting due to one of two missing proteins. A person with hemophilia can experience spontaneous bleeds, usually in soft tissue like muscles or joints — which swell, tighten and heat up, leading to movement loss in the joint. Bleeds in the brain can cause seizures, while those in the lungs can block airways. Compound those symptoms with that of HIV infection: body rash, fever, sore throat, nausea and vomiting, fatigue, severe headaches. Add to that the development of AIDS, which prevents the body from fighting off infection. In the 1980s, that was life for nearly 10,000 people with hemophilia who had contracted the deadly blood borne disease through weekly blood infusions. In 1981, researchers at UNC-Chapel Hill found themselves at the epicenter of this perfect storm. But it was the curiosity of one man — nearly 30 years prior — that set in motion events that would open a vast field of research at UNC and draw in hundreds of researchers across the university. Kenneth Brinkhous’ research and determination altered the course of global public health. With the passage of the years, it would transform the life of a man named George McCoy and the lives of countless others like him who turned to UNC-Chapel Hill in a quest to survive. The unpredictable nature of hemophilia intrigued Brinkhous, a researcher and clinical pathologist who’d been studying blood clotting since before World War II. In 1947, just one year after he came to UNC to chair the pathology department, he received a phone call that would change his life — and the world. A lawyer from New York had in his possession two purebred chocolate Irish setters that were producing puppies with frequent and severe bleeding. Veterinarians from Cornell University diagnosed them as the first known canine carriers of hemophilia A. These shaggy haired dogs, named Lynn and Nora, soon made their way to UNC, where Brinkhous directed the blood research laboratory (today’s Francis Owen Blood Research Laboratory). When Nora delivered a litter of puppies, all the males had hemophilia. The same phenomenon occurs in humans: Females are carriers and sometimes have bleeding problems, while males suffer from severe, spontaneous bleeding. Hemophilia affects one in 5,000 male births and 400 babies are born with the disorder each year in the United States, according to the Centers for Disease Control and Prevention. In 1953, by studying the blood of the hemophilic dogs, Brinkhous and colleagues Robert Langdell and Robert Wagner developed the partial thromboplastin time (PTT) test, which could identify hemophilia by showing how long it takes blood to clot. In developing this tool, the trio also discovered that the dogs with hemophilia A lack a blood-clotting protein called Factor VIII and found the same holds true for humans. Today, their PTT test serves as the standard screening tool for detecting human bleeding disorders in hospitals and clinics throughout the world. In the ’50s, it took an entire day to run just one or two of these tests. Now, there are 200 completed every day at UNC Hospitals alone. Brinkhous’ breeding experiments throughout the mid- to late-50s eventually led to the discovery that the gene for hemophilia is located on the X chromosome, which is why it’s incredibly rare for women to be diagnosed. Men only have one X chromosome while women have two, so each of a woman’s X chromosomes need to have the gene mutation for her to have hemophilia. 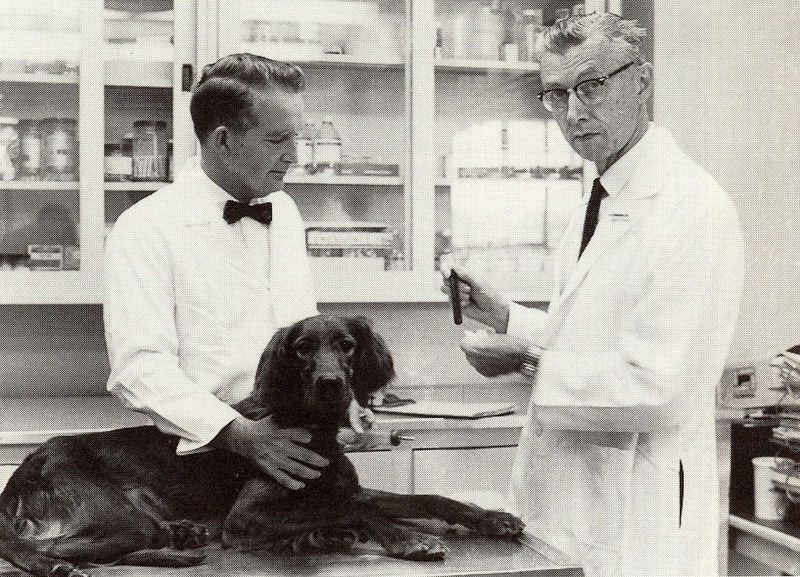 Approximately 80 percent of people with hemophilia have hemophilia A, while the remaining 20 percent have hemophilia B.
Kenneth Brinkhous (right) began studying the first known canine carriers of hemophilia in 1947. His research with dogs led to the creation of a blood laboratory, known today as the Francis Owen Blood Research Laboratory — which led to multiple advancements in hemophilia including a blood test, treatments, and knowledge of the disease. But just five years later, McCoy was still alive and continuing to manage his disease. Sadly, the same could not be said for his brother. Upon setting up a booth for a Halloween carnival at his son’s school, Richard overexerted himself and strained his abdomen. He began bleeding internally and was rushed to the hospital, where he later passed away. He was 29 years old. McCoy was only 16. In the 1950s, Brinkhous discovered that by transfusing the hemophilic dog population with Factor VIII-containing blood from healthy dog donors, they could live a normal life. Wagner, the biochemist in Brinkhous’ lab, developed a product called fresh frozen plasma (FFP) — a component of the blood responsible for clotting — by spinning blood products from thousands of donors around and around in a centrifuge. This action caused red and white blood cells to settle on the bottom and a yellow plasma to rise to the top. This plasma contained both Factor VIII and Factor IX (later discovered to be the missing protein for people with hemophilia B). People with hemophilia received transfusions of FFP in the hospital, but each bag contained so little clotting factor that large volumes were needed for the process. At this point, the life expectancy for someone with severe hemophilia was 20 years or less. A decade later, Stanford University’s Judith Graham Pool — a colleague of Brinkhous’ — discovered that FFP, upon thawing, left behind a thin sliver of insoluble material that was highly concentrated with Factor VIII. This product, called cryoprecipitate, could be used to control serious bleeding, making emergency surgeries and other procedures for hemophilia A patients more manageable. At UNC in 1965, Brinkhous, Wagner, Harold Roberts, William Webster, and G. Murray Thelin used a process called glycine precipitation to successfully purify both blood-clotting proteins by separating them from pooled plasma. By the 1970s, they had pioneered freeze-dried powdered concentrates containing Factor VIII and Factor IX — a product that could be stored in the home. As long as they had refrigerators and could self-administer an IV, persons with hemophilia would no longer have to spend much of their lives in the hospital. “Home therapy was really one of the first revolutions,” Timothy Nichols, current director of the Francis Owen Blood Research Laboratory, says. People were instructed to take an injection whenever they developed a bleed, which varied depending on the week. This advance led to the development of several commercial products including a freeze-dried Factor VIII concentrate made by Hyland Laboratories (now pharmaceutical giant Baxter). In reading about all the advances in hemophilia treatment, McCoy noticed that “UNC-Chapel Hill” dominated the footnotes. So, in the summer of 1970, he visited the university. While there, he experienced a life-threatening bleed. Harold Roberts — Brinkhous’ protégée — saved his life. McCoy knew then that Chapel Hill needed to be his new home and, in 1971, moved from Florida to North Carolina. “This was the ‘golden age’ in terms of treatment for hemophiliacs,” McCoy explains. “But cost was an issue. It could cost as much as $10,000 a year — and in the ’70s, that was a lot of money. And it was hard to get insurance to pay for it.” The average lifespan of a person with hemophilia, though, had increased to age 42. In 1980, a young doctor named Myron Cohen arrived at UNC. An assistant professor in the School of Medicine at the time, he also worked with UNC Hospitals’ consultation service, offering medical evaluations to patients there. The following year, he walked into an exam room to find a young, feverish man with hemophilia lying on a bed. The man’s lymph nodes had swelled to the size of a small fist. His cancer tests came back negative — but his body continued to deteriorate. Gallo got back to White almost immediately. AIDS had come to UNC. The patient’s symptoms continued to worsen and, eventually, he passed away. Within months, UNC Hospitals’ 30-bed AIDS ward filled to capacity. Between 1981 and 1984, more than 50 percent of the hemophilia population in the United States became infected with HIV. The news from Gallo that UNC’s patients had contracted AIDS led Cohen, Roberts, and the hospital’s director to call for an emergency meeting with the blood bank — AIDS had clearly made its way into the donor pool. “I don’t think there were many heroes during that time,” Roberts recalls, noting that nearly half of the hemophilia population contracted the disease through the blood supply. At that time, each plasma injection contained the blood of about 1,000 donors. For someone treating twice a week, that would be the blood of approximately 100,000 people per year. During this period, Roberts was the acting chairman for the National Hemophilia Foundation’s Medical and Scientific Advisory Council. “We argued about stopping blood products altogether,” he explains. “But the hemophiliacs would bleed to death without the blood.” The board advised hemophiliacs to continue their plasma treatments, but encouraged them to get their friends to donate so they had a better chance of receiving non-infected blood. White and Roberts’ decision to send the lymph node to Gallo not only exposed the danger of traditional plasma treatments to hemophiliacs, but was “instrumental in leading to the discovery of HIV as the causative agent of AIDS,” White explains. Gallo found the virus (then termed HTVL-III) present on the lymph node sample taken from UNC’s first patient with AIDS. By 1984, his group at the NCI and a team at the Pasteur Institute in Paris had identified HIV as the cause of AIDS. Gallo and other scientists, including UNC’s Gil White, were the authors of the first paper about HIV/AIDS to appear in the journal Science. It also marked the start of a new era in research at Carolina — one that would propel UNC’s scientists into the ranks of the world’s top experts on HIV and related diseases. McCoy was officially diagnosed with HIV in 1985 — but he believes he contracted the virus much earlier. The entire year prior, he had struggled with a bad bleed in his elbow and was infusing plasma nearly every other day. “There was no question in my mind I had HIV,” he says. By that point, new cases of HIV rarely arose in the hemophilia population. Plasma concentrate manufacturers would either inactivate the virus by treating blood products with heat; or remove the virus using a method called solvent-detergent extraction. Both processes only made the cost of treatment increase. One year prior, building on the legacy of UNC’s Kenneth Brinkhous, scientists at the Genetics Institute in Boston and Genentech in San Francisco genetically engineered the Factor VIII gene. They cloned and produced Factor VIII protein (called recombinant human factor VIII) in cultured hamster cells. It took three years for clinical trials to begin. “There was a lack of trust that had to be overcome,” Nichols explains. “The hemophilia population is one that had been helped and then suddenly hurt.” But when the time finally came to test the new products, the scientific community turned to UNC. George McCoy’s life had always been difficult. Despite the risks that an untested product could pose, he was ready for better treatment options. 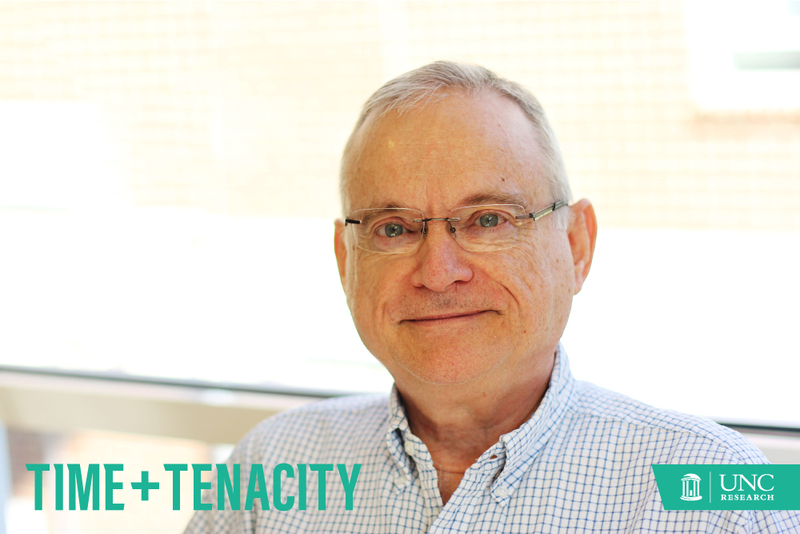 He became UNC’s — and the world’s — first clinical trial participant to receive the recombinant Factor VIII treatment. Upon administering that first infusion, White noticed that McCoy had his eyes closed, with his chin resting on his chest. “I asked if he was okay, but he did not answer,” White remembers. “I asked again, but no answer. Louder, I said, ‘Speak to me.’ He looked up at me and started making hamster noises, intending to suggest that the infusion of a product manufactured in hamster cells had turned him into a hamster.” White and McCoy still laugh about this today. That same year, the FDA approved the first effective weapon against HIV/AIDS — azidothymidine (AZT). When UNC was called on to become part of a multi-center clinical trial for the drug in the late ’80s, McCoy enrolled immediately. McCoy persevered through the stressful treatment and, over the next decade, enrolled in various HIV studies through the UNC Aids Clinical Trials Unit. His T cell count eventually rebounded. It was during this time that UNC transformed rapidly into a global research powerhouse for HIV/AIDS prevention and treatment. By 1990, UNC’s HIV researchers were headed to Malawi, Africa, to develop strategies for prevention and treatment. By the decade’s end, UNC had established the Center for AIDS Research, sponsored by NIH, to conduct a broad range of clinical, molecular, biological, and behavioral studies on the disease. HIV wasn’t the only blood borne disease contaminating blood products. By 1992, approximately 44 percent of all people with hemophilia contracted a never-before-seen type of hepatitis: the hepatitis C virus (HCV), an infection that inflames the liver. The onslaught of this new disease led to novel research and the emergence of the UNC Liver Center in 1998. He spent the next four months receiving frequent red blood cell transfusions. Two to three times a night, he would wake up covered in sweat — so much that he had to change the sheets on his bed. By October, his body began to produce red blood cells again. “We never established why I had that reaction,” he says. Doctors suspected the drug mix McCoy had been taking was responsible. Although it was a terrifying time for McCoy, the hepatitis C was eventually eradicated from his body, and for the next seven years, he was able to live a life free of HIV medication. But by 2008, new research showed that the virus produced low-grade inflammation in the body, leading to premature aging of the cardiac, cognitive, and renal systems. Although McCoy’s HIV viral load remained low, his cholesterol was elevated. To reduce his risk for inflammation, he resumed treatment for HIV and continues taking it today. McCoy’s dramatic progress as a patient mirrored the rise of UNC as an HIV/AIDS research epicenter, discovering public health factors behind the disease, developing new medicines and treatments, and testing them in clinical trials. In 2005, UNC joined an international effort to develop an AIDS vaccine through the NIH-funded Center for HIV/AIDS Vaccine Immunology. In 2010, Carolina researchers developed a vaginal gel that reduces a woman’s risk of HIV by almost 40 percent. Almost 70 years later, Nora and Lynn’s direct descendants live a nearly normal, high-quality life at the Francis Owen Blood Research Laboratory (FOBRL). Thanks to round-the-clock care and replacement of Factor VIII by highly skilled veterinary technicians at the lab, the dogs with hemophilia grow and thrive. Without it, they wouldn’t survive past their first year due to the severity of their bleeding disorder. Their contribution to understanding hemophilia and how to treat it in dogs and humans has become a UNC legacy. Today, Nichols and the FOBRL team focus on developing gene therapy for inherited bleeding disorders — their most recent contribution being an effective therapy for people with hemophilia B, which affects one in 35,000 births. The novel approach involves a one-time dose of new clotting genes as an alternative to a lifetime’s worth of multiple Factor IX injections. Three years into the study, the dogs that participated have experienced no more than one serious bleed per year. Before the therapy began, they had averaged five to 10 yearly bleeding events, each requiring medical treatment. Nichols expects to conduct further research on this gene therapy before beginning clinical trials. Nigel Key, current director of the UNC Harold R. Roberts Hemophilia and Thrombosis Center, is presently studying the mechanisms that trigger blood clotting in the body, whether by bleeding disorders like hemophilia or by overactive clotting inside a blood vessel — something called thrombosis. Most recently, Key led a national initiative to prioritize research on the prevalence and mechanisms of venous thrombosis in people with cancer. Clotting in the veins is a leading cause of death among patients undergoing chemotherapy, and approximately 900,000 Americans suffer from the condition each year, according to the CDC. Key is one of many researchers who have made major advances in blood clotting at UNC. In 2011, biologist Darrel Stafford earned an Innovator of the Year award from UNC’s Office of Technology Development for his work in blood coagulation. He has had more than 70 patents issued over the course of his career including a genetic test that predicts how sensitive a patient will be to a common blood thinner. Most recently, along with colleagues Dougald Monroe and Brian Cooley, Stafford’s group has used mouse models of hemophilia to challenge existing teaching on how replacement of Factor IX acts to stop bleeding in patients with hemophilia B. His lab has now designed, modified, and improved forms of synthetic Factor IX that may come to the clinic in the next decade. In 2014, pathologist Alisa Wolberg observed that inhibiting the enzyme Factor XIII would successfully reduce the size of a blood clot by 50 percent. In doing so, her group described a completely novel way to prevent blood clotting, namely reducing the number of red blood cells trapped in a clot. These observations may pave the way for the development of a completely new class of blood thinner drugs in the future. In 2015, both Wolberg and Nigel Mackman were honored for their research accomplishments by the International Society on Thrombosis and Hemostasis — Mackman with its Distinguished Career Award and Wolberg with an Investigator Recognition Award. As for HIV/AIDS, UNC remains an international leader in research. Seeing UNC’s first patient with AIDS in 1981 had a profound influence on Myron Cohen. Originally recruited to study sexually transmitted diseases (STD) and inflammation, he shifted his focus to HIV. In 2011, he led a study that revealed early treatment with antiretrovirals — which prevent the spread of HIV — can reduce sexual transmission of the disease by 96 percent. The journal Science named his study the “2011 Breakthrough of the Year.” Today, Cohen is focused on eliminating HIV from the genital tract. UNC’s emergence as a trailblazer in HIV research has inevitably drawn in scientists from multiple disciplines on campus. In 2009, UNC chemist Kevin Weeks and his research team decoded the HIV genome, advancing the development of new therapies and treatments. This past March, UNC pharmacologist Angela Kashuba discovered that women require daily doses of HIV antiviral medication Truvada to prevent infection while men only need two doses per week. In the School of Medicine, David Margolis became one of the first researchers to develop ways to force HIV particles out of latency — a major hurdle to finding a cure. He was recently awarded $23 million over the next five years to pursue a cure for the disease. UNC’s work in the areas of blood clotting, hemophilia, and HIV/AIDS has driven numerous industry partnerships. To date, 13 startup companies have formed to tackle prevention, treatment, and cures for blood disorders and HIV/AIDS. These include Glycan Therapeutics, Entegrion, and Chatham Therapeutics (a subsidiary of Baxter), to name a few. Most recently, in spring 2015, UNC partnered with GlaxoSmithKline to form the HIV Cure Center and the business Qura Therapeutics — a unique public-private corporate partnership focused on finding the cure for HIV/AIDS. Today, at Carolina, annual funding research related to HIV/AIDS and blood disorders tops $250 million. Kenneth Brinkhous chaired the UNC Department of Pathology within the UNC School of Medicine from 1946 to 1973, and founded the Francis Owen Blood Research Laboratory in 1947. He was nominated twice for the Nobel Prize for his work with Factor VIII and was the first scientist to ever receive 50 years of continuous research funding from the National Institutes of Health (NIH). Robert Langdell was a professor of pathology who worked in the Francis Owen Blood Research Laboratory. Robert Wagner was a biochemist and pathology professor in the UNC School of Medicine from 1950 to 1986, and also served as director of graduate studies for the Department of Pathology from 1964 to 1986. Timothy Nichols is the current director of the Francis Owen Blood Research Laboratory. He is also a jointly appointed faculty member in the Division of Cardiology in the Department of Medicine and the Department of Pathology and Laboratory Medicine, as well as a clinical physician with the UNC Center for Heart and Vascular Care. Myron Cohen is UNC’s associate vice chancellor for global health; director of the UNC Institute for Global Health & Infectious Diseases; chief of the Division of Infectious Diseases; and the Yeargan-Bate Distinguished Professor of Medicine, Microbiology and Immunology, and Epidemiology. Gil White worked at UNC from 1976 until 2004. He served as the director of the Comprehensive Hemophilia Diagnostic and Treatment Center from 1992 to 2004, Aster Chair of Medical Research, and director of the UNC Harold R. Roberts Hemophilia and Thrombosis Center from 1998 to 2004. Today, he is the executive vice president for research at the BloodCenter of Wisconsin and the associate dean for research at the Medical College of Wisconsin. Harold Roberts is the Sarah Graham Kenan Professor of Medicine and Pathology and Laboratory Medicine. For 20 years, he served as the director of the UNC Harold R. Roberts Hemophilia and Thrombosis Center, which he founded in 1978. Nigel Key is the Harold R. Roberts Distinguished Professor of Medicine and Pathology, chief of the Section of Classical Hematology, and director of the UNC Harold R. Roberts Hemophilia and Thrombosis Center. Darrel Stafford is a professor in the UNC College of Arts & Sciences Biology Department. Alisa Walborg is an associate professor in the UNC School of Medicine’s Department of Pathology and Laboratory Medicine. Nigel Mackman is the John C. Parker Distinguished Professor of Medicine, director of the UNC McAllister Heart Institute, co-director of the Thrombosis and Hemostasis Program, and a member of the UNC Lineberger Comprehensive Cancer Center. Kevin Weeks is the Kenan Distinguished Professor in the UNC Department of Chemistry and a member of the UNC Lineberger Comprehensive Cancer Center. David Margolis is the director of the HIV Cure Center and a professor of medicine, microbiology and immunology, epidemiology within the School of Medicine. He is also the leader of the Collaboratory of AIDS Researchers for Eradication (CARE), which brings together leading minds from top U.S. academic institutions in the fields of HIV latency as well as the pharmaceutical industry to find a cure for HIV. Angela Kashuba is the John & Deborah McNeill, Jr. Distinguished Professor in the UNC Eshelman School of Pharmacy. She is also director of the Center for AIDS Research Clinical Pharmacology and Analytical Chemistry Core and an adjunct professor in the Division of Infectious Diseases. UNC Research would like to acknowledge and give special thanks to the contributions of George McCoy and the many others who have selflessly contributed to the clinical research that helps drive and inform science and discovery at the university.